The Sinn U2 case is made from the same German steel that is also used in the construction of the outer hull of submarines. The steel was procured by Sinn from a steel supplier to Emden GmbH, one of Germany's North Sea shipbuilding yards who construct submarines from the very same steel. The U2 features an inert gas filled cavity with two copper sulphate humidity absorbing capsules, one of which is visible at 6. Other features include sapphire crystal with hardened anti-reflective coating, and silicone rubber strap with double push deployant buckle and fliplock safety clasp. Verified Owner Comments: This is a tool watch through and through. I love how purpose-built it feels. It is highly legible, with a big, bright lume plot at zero on the bezel. The second time zone is also well-executed, dropping into the background when you’re focused on the main time, but right there when you need it. Finally, the technical features are great: huge water resistance, captive bezel, dehumidifying capsule visible at 6 o’clock, antimagnetic. All in all, a hard working, well designed watch. Verified Owner Comments: I just picked up the Sinn U2 EZM5. The pictures online do it no justice, it is spectacular. Right away you feel the heft and presence of this watch. You can tell this is a piece of equipment made to perform in every respect. At the same time it is classy and refined with an everyday wear appeal. Sinn has a winner with this watch. 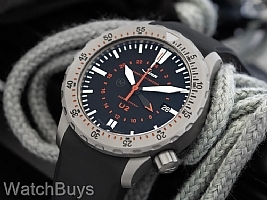 If you are looking for a true dive watch ready to be used as intended or just looking for something that not everyone has, you have to check out this watch. As always Watchbuys was amazing, buy from them with complete confidence. Verified Owner Comments: Sinn U2 EZM 5 - a great buying experience! Awesome watch and strap. Presents small for a 44mm case however, combined with the weight and strap dimensions, its an imposing timepiece. Extremely legible dial and great features. Be careful when trimming the strap down to size and do it in stages. Once cut, it's irreversible, and replacement straps are expensive. Outstanding communication and customer service from Watchbuys! "Great watch - Great WatchBuys"
Verified Owner Comments: This is a wonderfully crafted watch and as durable as they come. The quality and design is outstanding. WatchBuys was great about answering questions at time of purchase. Unfortunately, about 6 months after I received the watch, it stopped working. As I was in Japan at the time, I had an authorized repair shop (this watch is gas-filled so you don't want to take it to just any shop) do the repair. Cost me about $100 to fix, but haven't had any trouble since. This experience should not deter you from purchasing this watch. It is one of the best in my collection!! Verified Owner Comments: The build quality of the U2 is superb; easily on par with Rolex, Omega and Breitling which I've owned. The watch is big, but does not feel big on the wrist. Face is extremely legible. Very pleased with this watch. The service I received from WatchBuys was second to none. Matt even answered a general question on a Saturday - even though WatchBuys isn't open! Watch arrived as ordered, brand new in box and with no surprises. Sinn is a great brand. WatchBuys is a great retailer. Verified Owner Comments: Comfortable to wear,easy to read by day and night, super bold and solid, great design and my favorite sports and action timepiece !!! Verified Owner Comments: One of my two best timepieces, the other being the Sinn U1000S EZM 6. Build quality is superb and robust. Verified Owner Comments: Toughest mechanical diver money can buy, with technical features such as Argon filled case and copper sulphate dehumidifying crystals. Verified Owner Comments: Impressive weight! As always the U series is a no brainer especially when it's an EZM watch. I strongly recommend picking up the leather strap with red stitching as well...simply stunning! Verified Owner Comments: Deceptively comfortable watch with a tasteful "tactical" appearance, exceptional overall quality, and superb scratch resistance. Verified Owner Comments: i can beleive the U2 is full of super quality and feeling when putting on my arm. Verified Owner Comments: Superb! Great to wear despite weight and size. No sharp edges that catch clothing. Excellent timekeeping. Superior to my other dive watch, a Rolex Submariner. Verified Owner Comments: I love it! Verified Owner Comments: Nice watch. Size and heft are impressive , just the right combo. Tough well put together watch . An eye-catcher to " Boot " ( pun intended ).